The naked mole rat is arguably one of the world's strangest mammals, combining a number of crazy and unique traits that no other mammal has. Some of these traits include a lack of pain sensation, very low metabolic and respiratory rates and an apparent immunity to cancer! Interestingly, they are also one of the handful eusocial mammals we know, meaning that they form societies similar to those of ants and termites! All these and even more will be covered in full detail later in the article. If you find this mammal interesting after reading this article, I highly suggest you to have a look at the platypus, a cute little mammal from Australia that also features all kinds of bizarre evolutionary adaptations. The species is native to the drier parts of the tropical grasslands of East Africa, occurring throughout most of Somalia, central Ethiopia, and much of northern and eastern Kenya, extending as far south as the eastern border of Tsavo West National Park and the town of Voi. 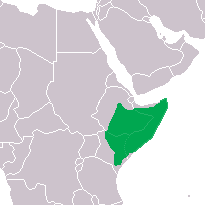 The species has also been recorded in Djibouti, indicating that it has a wider range than the one currently known. 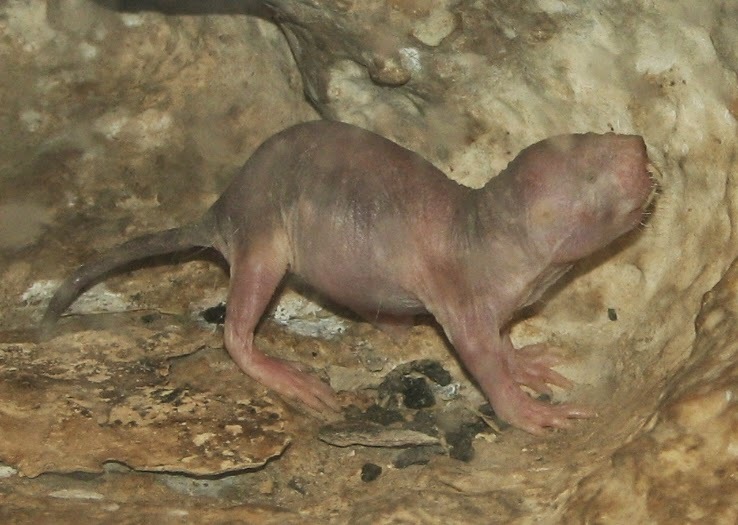 It has an altitudinal range, starting from 400 to 1,500 m.
Naked mole-rats live in arid habitats, characterized by high temperatures and low and irregular rainfall, which usually averages at 200-400 mm per year. They are most commonly found in hard, consolidated, lateritic loams, although they have been sighted in fine sand. It is a burrowing rodent and the sole representative of the genus Heterocephalus. Adults are 8 to 10 cm (3-4 in.) long and have a weight that ranges from 30 to 35 g. However, queens tend to be larger and many times weigh well over 50 g, with the heaviest ever recorded queen being 80 g.
The legs are thin and short but still allow them to casually move underground, even backwards; almost at the same speed. They use their protruding teeth to dig, while their lips are sealed just behind them, in order to prevent soil from filling their mouths while doing so. 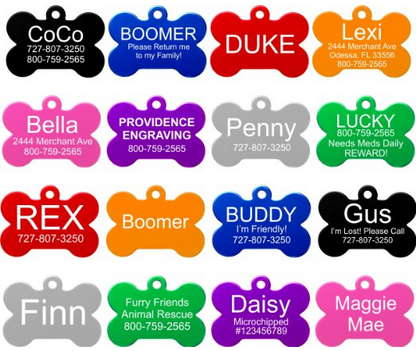 They have very little hair and the body is covered by wrinkled pink or yellowish skin. They have small eyes and poor vision, not that they need it much, as there is little to no light in the tunnels they inhabit. 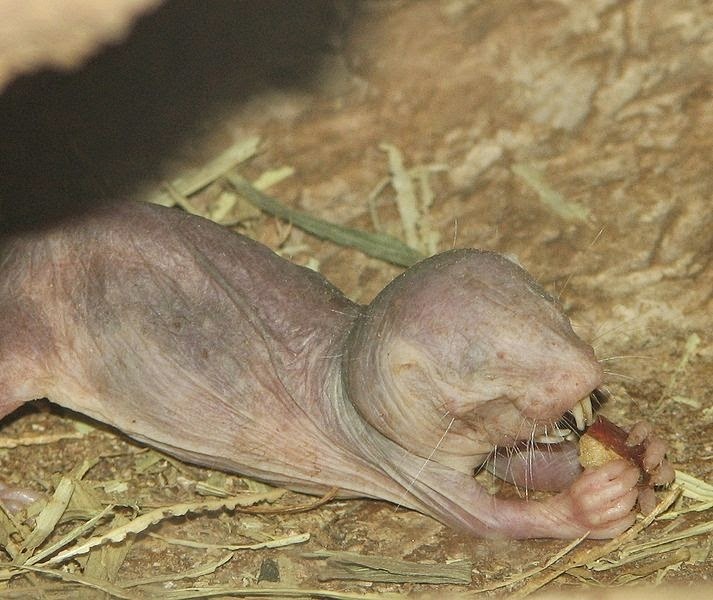 The naked mole rat has sensory whiskers on its face and tail, along with some hairs between the toes, enabling the feet to function as brooms with which it sweeps the soil. Oxygen availability in the burrowing nests is limited and the species has adapted adequately. The naked mole rat has very small lungs whereas its blood has a very strong affinity for oxygen, greatly increasing the efficiency of oxygen uptake. Considering their size and rodent nature, the respiration and metabolic rate of the species is extremely low, only 2/3 of what is expected of similarly sized rodents. Additionally, they have the capacity to reduce their metabolic rate by an extra 25 % in periods of famine. Their skin lacks a key neurotransmitter known as "substance P". In mammals, this neurotransmitter is responsible for sending pain signals to the central nervous system. As a result, they experience no pain when exposed to acids or capsaicin. This is most probably an evolutionary adaption that allows them to live pain-free in their tunnels, characterized by high levels of carbon dioxide resulting from poor ventilation. It is assumed that substance-P deficiency is also why these strange animals don't exhibit the histamine-induced itching and scratching behavior which is typical of rodents. Contrary to all other mammals - including humans -, the naked mole rat doesn't regulate its body temperature to a fixed temperature (homeostasis). Instead, they are thermoconformer animals, meaning that their body temperature is subject to changes, depending on the environment's temperature. As of 2014, the species remains the only known mammalian thermoconformer. However, the relationship between oxygen consumption and ambient temperature switches from a typical poikilothermic pattern to a homeothermic mode at temperatures of 28 °C (82.4 F) or higher. At lower temperatures, they use behavioral thermoregulation. When cold, they cuddle together or bask in the shallow, more sun-warmed parts of their tunnels. Conversely, when they get too hot, they retreat to the deeper, cooler parts of their burrow systems. Another interesting fact about these weird animals is their extraordinarily long life span. They can live to be at least 28 years old and hold the record for longest living rodents. The exact mechanisms behind their longevity have yet to be unveiled, however their longevity is believed to relate to their low metabolism which in turn prevents oxidative stress and damage. One other strange thing about these rodents is that they seem to have a very high resistance to cancer. Actually cancer has never been observed in them, they may as well be immune to it! Like most mammals, naked mole rats have a gene (known as p27) which prevents cell division once a group of cells reaches a certain number. Furthermore, they are also protected by the p16 gene, which does much about the same job, although it has a lower cell-number threshold, compared to p27. The combination of these two genes acts as a double barrier to uncontrolled cell proliferation, protecting the species from the onset of cancer. On June 19, 2013, researchers from the University of Rochester, reported that one other possible reason that naked mole rats are impervious to cancer may be because they produce an "extremely high-molecular-mass hyaluronan" (HMW-HA) (a natural sugary substance), which is over "five times larger" than that in cancer-prone humans and cancer-susceptible laboratory animals. Few months later, the same research team reported that naked mole rats have ribosomes that produce extremely error-free proteins. For these two "achievements", the journal Science named naked mole rat as "Vertebrate of the Year", in 2013. Colonies range in size from 20 to 300 individuals, with the average number being 75 individuals per colony. The relationship between the queen and the breeding males lasts for many years, while the rest of the females are temporarily sterile. A queen's typical life ranges from 13 to at least 18 years. They are very hostile to females that start to behave like queens or produce hormones for becoming queens. The queen's urine contains certain chemicals (pheromones) which prevent other females in the nest from having pups of their own. She is also very dominant and the stress caused by her "bullying" keeps the other females from breeding. After the queen dies, another female takes her place, many times following a violent struggle among other female "champions". Once the new queen has established her dominion, she stretches the space between the vertebrae in her backbone and becomes longer and ready for bearing pups. Click here for more strange animal babies ! As aforementioned, workers are sterile. Similarly to ants, they are further divided into castes. Some are tunnellers, expanding the large network of tunnels within the burrow system and some are "soldiers", protecting the group from outside predators. 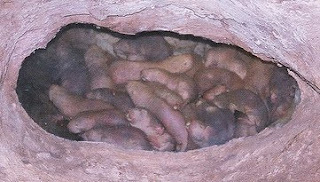 Naked mole rats primarily feed on very large tubers they find inside their burrowing tunnels, which commonly weigh as much as 1000 times their average body weight. A single tuber may be enough to feed the colony for months, or even years, as they are smart enough to eat the inside but leave the outside, allowing it to regenerate. They also eat their feces (coprophagia), most probably because the tubers and roots are hard to ingest. By eating their feces, they get a second chance to absorb the tuber's nutrients. Two meals for the price of one! This behavior serves another purpose as well. The members of the colony routinely roll around the "toilet" chamber, acquiring a distinctive smell that allows them to identify intruding individuals from other colonies. Surprisingly, they obtain all water through their food, they do not drink a single drop of water. In captivity, the species consumes sweet potatoes, all kinds of fruits, baby cereals, dog biscuits and other treats. Naked mole rats are currently listed by the IUCN as of Least Concern and this won't probably change anytime soon. The species distribution falls under several protected areas, including Tsavo, Meru, and Samburu National Parks in Kenya and has no known threats that endanger its survival. 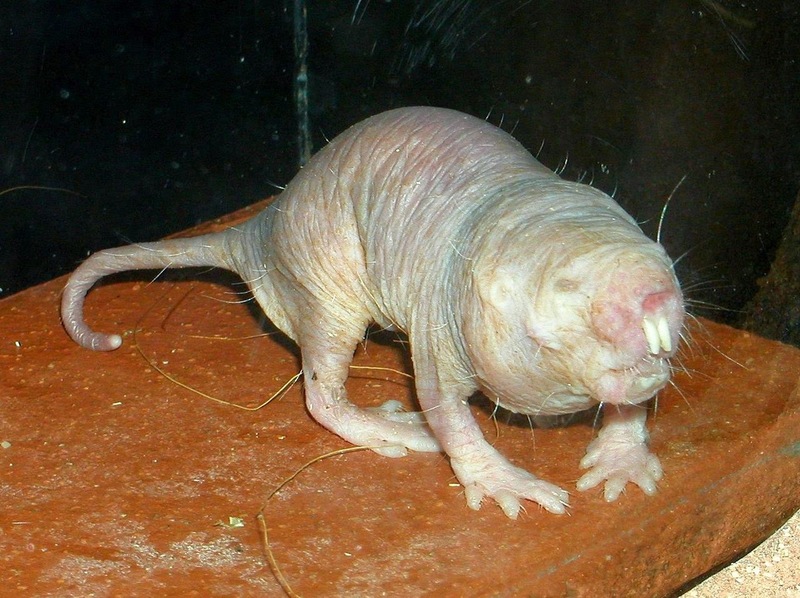 - When naked mole rats are injected with substance P, they appear to regain their pain sensation, although it seems to work with capsaicin and not acids. - Blind mole rats Spalax golani and Spalax judaei are two other rodents with an apparent immunity to cancer, although different mechanisms seem to be involved. - Maree, S. & Faulkes, C. (2008). Heterocephalus glaber. In: IUCN 2008. IUCN Red List of Threatened Species. - Sherman, Paul W.; Jennifer Jarvis, Richard Alexander (1991). The Biology of the Naked Mole-rat. Princeton, N.J.: Princeton University Press. ISBN 0691024480.